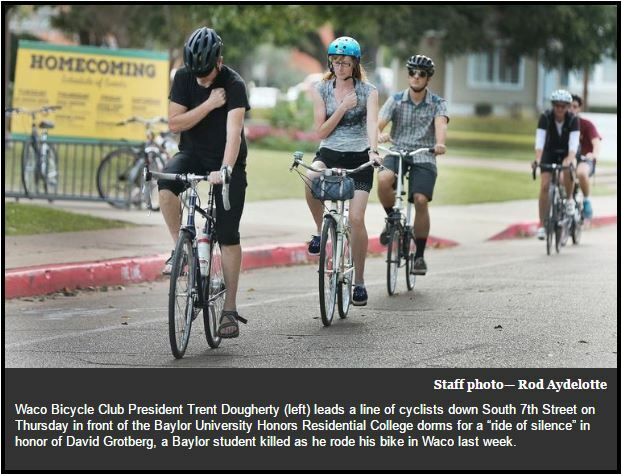 The Waco Bicycle Club showed cyclist solidarity Thursday evening in a “ride of silence” to honor a Baylor University sophomore who died in a hit-and-run crash on Franklin Avenue last week. A row of about 40 cyclists pedaled from Baylor’s Fountain Mall past the front of the honors dorms, where David Grotberg, 19, lived. A crowd of family, friends and students stood outside to remember the Fergus Falls, Minnesota, native who was active on campus, participated in Baylor Golden Wave Marching Band as a trumpet player and was the founder and president of the Ballroom Dance Society. Read the rest of the Waco Trib article by Kristen Hoppa.